The SHSU Student Health Center will administer the influenza vaccine at no charge to students on Tuesday (Oct. 5) and Wednesday (Oct. 6), from 9 a.m. to 4 p.m. in the Lowman Student Center Atrium. In order to receive a flu shot, students must present their student identification card and are asked to come prepared by wearing sleeves that can be easily adjusted to expose the shoulder in order to speed the administration of the vaccine. There will be an area to disrobe with privacy screens, but an easily accessible injection site will make the process faster and more comfortable, according to health center interim director Sarah Hanel. A separate date will be designated for faculty and staff members later, once the second shipments come in, according to Hanel. For more information about the influenza vaccine or the administration process, visit www.shsu.edu/healthcenter or call 936.294.1805. Don’t want to fight the traffic or pay for parking at Reliant Stadium? The Sam Houston State University Alumni Association will sponsor a charter bus to the “Battle of the Piney Woods” football game in Houston on Oct. 23. The bus will depart the Bowers Stadium parking lot at 10 a.m. and return immediately following the game. Kickoff is at 2 p.m.
“The Alumni Association is reaching out to alumni, students and friends of the university to bring everyone together for one common cause, their love of SHSU and support of the Bearkats," Vienne said. "We want to provide a family atmosphere with high energy and excitement for individuals of all ages." Alumni Association tailgating for the Bearkats versus Stephen F. Austin game will begin at 11:30 a.m. on game day in Lot 22, which can be reached by entering from Kirby Drive. The first 1,000 fans at the alumni tailgate area will receive a complimentary hot dog and chips, and a cash bar will be available in the tailgate area. In addition, each of SHSU’s five colleges and Student Activities will also be set up in the Lot 22 area. “This game is a huge opportunity for the university as the exposure we are receiving, and will receive, will benefit us for years to come—not just on a regional level, but on a national level as well,” Vienne said. “We need to show our ‘Bearkat Pride’ to ensure there is more orange in the stadium than purple. “We want to make certain this is as close to a home game for the Bearkats as you can get,” he said. The cost for transportation is $25 per person. Seating is limited to 49, which will be filled on a first-come, first-served basis. Reservations are requested by Oct. 20. For more information, or to reserve a seat, call the Office of Alumni Relations at 936.294.1841 or e-mail alu_kat@shsu.edu. On New Year's Eve 1995, Kristin Cooper, a 20-year-old Alpha Chi Omega sorority member, committed suicide after being raped by a friend. Three years later, Kristin’s mom, Andrea, decided to share her daughter’s tragedy with college students across the country. On Thursday (Oct. 7), Cooper will share “Kristin’s Story” with the Sam Houston State University campus. Sponsored by the Alpha Chi Omega, Zeta Tau Alpha, Sigma Sigma Sigma, Alpha Delta Pi sororities in order to raise awareness about the domestic violence, the lecture will begin at 7:30 p.m. in the Lowman Student Center Ballroom. One in four women are affected by domestic abuse and violence, according to Sara Rider, Alpha Chi Omega member and vice president for the National Panhellenic Council. The SHSU Counseling Center will be on hand for students to talk about domestic violence that has affected them or people they know. Free wristbands and T-shirts will be given at the event. For more information, contact Rider at sbr003@shsu.edu or visit http://www.kristinsstory.com/. The Sam Houston State University Department of Theatre and Dance will present the musical rendition of famed director Guido Contini’s search for inspiration for the plot of his new film with “Nine” Wednesday through Saturday (Oct. 6-9). Caught up in the chaotic lifestyle of the famous, Contini is faced with ghosts from his past revealing his ever-changing romantic involvement with a series of influential women. Based on the 1963 film by Federico Fellini, “Nine” opened to rave reviews on Broadway in 1982, winning five Tony Awards, including Best Musical. The book was written by Arthur Kopit, with music and lyrics by Maury Yeston. The cast includes Michael McClure (Guido Contini), Randall Carpenter (Little Guido), Nina Garcia (Carla), Katelyn Johnson (Stephanie Necrophorus), Maureen Mizner (Our Lady of the Spa), Kate Rose (Guido’s mother), Colleen Trotter (Claudia), Kimberly Truncale (Sarraghina), Madison Turner (Liliane La Fleur), Teresa Zimmerman (Luisa) and Autumn Woods (Lina Darling). Ensemble members include Lindsey Edwards, Brittany Halen, Ashley Johnson, Brittni Merritt, Elizabeth Tinder, Danielle Turner, Robin Van Zandt, Melissa Molano and Elizabeth Vining. “Nine” is directed by theatre faculty member Larry Smiglewski, with musical direction by theatre faculty member Laura Avery and student Kelly Martin. The choreography is by dance faculty member Jonathan Charles. The stage manager is senior theatre major Caitlin Kellermeyer. Designers include senior theatre majors Mike Weiss, set, and Heather Selbe, costumes. Guest artist Chris Krumins, senior theatre major Josh Fehrmann, and communications major Taylor Gunderdon are the sound designers. Theatre faculty member Eric Marsh is the lighting designer. Before the production, SHSU will formally dedicate the Erica Starr Theatre in honor of its namesake beginning at 6:30 p.m. The event will include comments by Jaimie Hebert, dean of the College of Arts and Sciences; Dana Nicolay, associate dean of the College of Arts and Sciences; Penny Hasekoester, theatre department chair; and Mike and Nancy Czerwinski, parents of Erica Starr Czerwinski. A reception will follow. Tickets are $15 for general admission and $12 for SHSU students and senior citizens. Group rates are also available. Sam Houston State University’s dance program will present “22 of the country’s most promising choreographers” during the fourth annual Dance Gallery Festival at SHSU Friday and Saturday (Oct. 8-9), according to Andy Noble, assistant professor of dance. The “New York Meets Houston” concert will be held at 8 p.m. each evening in the Performing Arts Center Dance Theatre. The concert will include emerging and renowned modern dance choreographers from around the U.S., Noble said. Among the companies slated to perform from New York are 360º Dance Company, an internationally acclaimed group that presents modern-dance classics juxtaposed with cutting edge, contemporary dance works; and VON USSAR danceworks, considered one of New York’s new up and coming companies, presenting an all-time favorite “Nothing But The Truth,” a piece that “tests the strength and vulnerability of women in today’s world,” according to Noble. Noble’s NobleMotion will be showcasing a new work, “Photo Box D,” that includes an original light installation by Jeremy Choate. “‘Photo Box D,’ both dark and mysterious, creates optical illusions where the dancers disappear and reappear,” Noble said. Other participating artists include the BARKIN/SELISSEN Project (N.Y.), Shelley Bourgeois (Fla.), Cheyla Clawson (Okla.), Dorcas Roman Dance Theater and somebodies dance theater (both from Calif.), Doris Hudson de Trujillo (Utah), and from Texas, Houston Metropolitan Dance Company, Revolve Dance Company and Suchu Dance. Tickets are $20 for general admission and $15 for senior citizens and students. For more information, contact the PAC Box Office at 936.294.2339 or visit www.dancegalleryfestival.com/#/Festivals. The SHSU School of Music will bring the east to the west on Tuesday (Oct. 5) with a chamber performance that will kick off three concerts during the week. The "East Meets West: Chamber Music for Saxophones, Trumpets and Percussion” will begin at 7:30 p.m. in the Performing Arts Center Recital Hall. The concert will feature music from South America, Africa, Japan, Europe and the United States, including an original work composed by John Lane, SHSU associate professor of percussion. Lane also will perform a solo piece and a duet with professor of saxophone Scott Plugge. Admission is free for the performance. On Thursday (Oct. 7), the SHSU Wind Ensemble will perform pieces by Richard Strauss, Frank Ticheli and Joseph Schwantner at 7:30 p.m. in the PAC Concert Hall. Tickets are $15 for general admission and $12 for senior citizens and students. Finally, on Friday (Oct. 8), Grammy-nominated, multi-gold, platinum producer and SHSU alumnus Gary Powell will showcase the students he selected to participate in his Producers Workshop at 7:30 p.m. in the PAC Recital Hall. After the performances, the student who will be chosen from among the participants to record a single with Powell in his Austin studio will be announced. The winner will also receive a $300 cash prize from the School of Music. For more information on any of these events, call the School of Music at 936.294.1360. SHSU’s foreign languages and history departments and the Viking Society will look at America “Before Columbus” with a mini-conference on Friday (Oct. 8). The second annual event, which will include lectures by two SHSU professors and the president of the Society for Norse History and Culture, will be from 3-4:30 in College of Humanities and Social Sciences Building Room 120. Presentations will include “Leif Eiríksson: Norse Explorer and Founder of Vínland,” by James Frankki, assistant professor of German and academic adviser to the Viking Society; “Why Did the Vikings Leave North America?” by Justin Vance Tyree, president of the Society for Norse History and Culture; and “The Image of the Norsemen in American and World Cinema,” by Nicholas Pappas, associate professor of history. For more information, contact Frankki at jlf017@shsu.edu or visit http://www.viking-society.org. An installation that examines “the tragicomic impossible situations, and the isolation stemming from the conceitedness of feeling ‘different and better than anybody else’” will be on display in the Gaddis Geeslin Gallery Thursday (Oct. 7) through Oct. 28. An artist talk and opening reception for “Zummarella,” a concept collaboration by artists Min Kim Park and David Swenson, will be on Thursday from 4-5 p.m. and from 5-7 p.m. The artist talk will be held in the Art Auditorium, in Art Building E Room 108. The reception will be held in the Gaddis Geeslin Gallery, in Art Building F.
“Zummarella” is “a caricature about woman who has it all,” according to the artists. The mixed media work—which includes photography, sculpture and video—“deals with the status of empowered women in rapidly globalized world. “The challenges facing these women are super-heroic in proportion, whether it is self-imposed or imposed from the outside through contemporary social mores, even though these woman are highly empowered,” the artists said in a statement about the piece." Born in South Korea, Park has been exploring the issues revolving around gender, ethnicity and identity using performance, video, photography, sound and site installation in her works. In the past three years she has exhibited at the University of Wisconsin, Eau Claire, Arizona State University, Emory University, North Dakota State University. Park received a Master of Fine Arts degree in photography from University of New Mexico and is currently a visiting assistant professor at the College of St. Benedict and St. John’s University. Swenson is an associate professor in the department of visual arts at North Dakota State University, focusing on sculptural media and research in wood kiln design and construction. Works such as those above, created by SHSU alumnus and award-winning artist Ottis Hilburn, will be on display in the Lowman Student Center Art Gallery through Oct. 9. A “One-Man Show” featuring the artistic renditions of Ottis L. Hilburn will be on display in the Lowman Student Center Art Gallery through Oct. 9. The exhibition includes oil, acrylic and watercolor paintings, as well as bas relief of strange creatures and sculptures in metal, wood and clay. A native Kansan, whose parents were sharecroppers, Hilburn earned two master’s degrees, one from SHSU, and a doctorate from Texas A&M. His academic work led him into college teaching and higher education administration, serving as dean and vice president of an Oregon college and vice president of another in the Philadelphia area. All through his school years and later employment he kept a strong desire to create art. He won national art awards and an art scholarship while in Wichita, Kansas, he said. As a freshman he was art editor of his school’s yearbook and later became a college paper’s cartoonist. For a time he was employed as a technical illustrator for the oil industry. He also worked with architects to help design a new college campus. Upon retirement a decade ago, Hilburn decided to try to develop his artistic talents and interests, he said. He won numerous awards, seven last year alone, at both the local and state level. He has served as president of the Conroe Art League, now one of the leading art organizations in the state of Texas, and taught youth various art classes at the Katy Center for the Performing and Visual Arts. 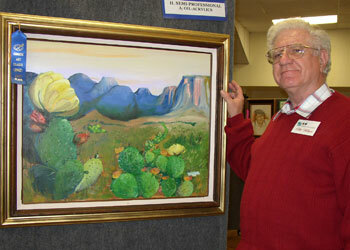 In Huntsville, he has served as manager of the Gift Gallery and teacher at the Wynn Home Arts Center. While his wife Bonnie’s and his artistic interests have taken them to most of the major art museums of the world, his particular delight has been to explore the folk art of Africa, India, native America and Russia, he said. He has an extensive collection of cultural folk art while his own paintings are in England, Canada, Russia and Austria. His wife is also an SHSU alumna. His sculpture has always been a vital part of his artistic production, consistently winning awards, he said. Sam Houston State University’s Kat Klub, located on the first floor of the Lowman Student Center, is adding additional features for students to enjoy this month. A video wall on the north wall of the Kat Klub is among the new features. It will consist of nine 46-inch LCD televisions set up in a 3-by-3 foot matrix to make one 10-by-6 foot high definition image. “We will have this set up to show HD television as well as a Playstation 3 and Xbox 360 hooked up this video wall for HD gaming,” said Rueben Pena, LSC operations supervisor. “The video wall will have its own independent sound system consisting of two 1000-watt speakers to provide superior sound for movies, television or video games." A high definition projector, which will project a 13-by-7 foot image, will be added to the west wall of the Kat Klub to replace an older big screen TV. The projector will also be set up to play HD television as well as Playstation 3 and Xbox 360 video games. “We are also working with a company to get licenses from for Electronic Arts, Microsoft, Ubisoft, Activision, Stardock, NCsoft and Sony Online to allow Sam Houston students to play a wide variety of these manufacturer's video games on our campus,” said Pena. In November, at least four 3-D TVs, ready for next generation 3-D gaming, will be added to hook up solely to Playstation 3, Xbox 360 and Nintendo Wii consoles for students. These TVs will be mounted on the south wall of the Kat Klub at the main entrance. “We plan to offer more programming in the Kat Klub by working closely with Program Council and Student Activities to offer free activities and programs in the Kat Klub,” Pena said. “Our annual Super Bowl Party is a huge draw, and we hope to have many similar programs throughout the year to make sure as many students as we can reach enjoy the Kat Klub and all the amenities we have to offer." October is Archeology Month in Texas, and to recognize that designation, the Sam Houston Memorial Museum will showcase a collection of photographs of rock art images across the state. “Rock Art Perspectives” will be on display in the Katy and E. Don Walker, Sr., Education Center Exhibition Gallery Oct. 5 through Nov. 26. An opening reception will kick off the exhibit on Tuesday (Oct. 5), from 5:30-6:30 p.m. in the center. The exhibit will feature photographs by Carolyn Boyd, executive director for the Studying Human Use of Materials, Land and Art school, as well as the SHUMLA academy itself and from Sandra Rogers, Sam Houston Memorial Museum registrar of collections. Photographs of the 4,000-year-old rock art preserved in the Lower Pecos Canyonlands, as well as rock art images found in other parts of Texas, will be on display. Other Archeology Month activities include “Archaeology Day” on Oct. 15, when fourth graders from Huntsville’s Stewart Elementary will visit the museum to receive a hands-on introduction to the area with the staff. Boyd will also come to Huntsville on Nov. 3 to discuss her recent work regarding rock art and sign copies of her book Rock of the Lower Pecos, published by Texas A&M University Press. The lecture and signing will be held at 6:30 p.m. in the Walker Education Center Auditorium. The SHUMLA School is a nonprofit archeological research and education center working internationally to connect people of all ages with the land and their cultural heritage. For more information, contact Roon or Rogers, at the Sam Houston Memorial Museum, at 936.294.1832. Approximately 85.5 million people ages 16 and older were estimated to have driven under the influence of alcohol within a month’s time according to the 2008 National Survey of Drinking and Driving Attitudes, up from almost 74 million in 2004. Of these, 78 percent of the trips were made by males. These statistics reversed a declining trend of alcohol-related driving trips since 1995, according to Rosanne Keathley, Alcohol and Drug Abuse Initiative coordinator. The ADAI and the Eta Sigma Gamma National Health Honor Society will test students’ knowledge of such alcohol-related issues, including current alcohol laws, during its final SWAAT event of the semester on Tuesday (Oct. 5). "Are You Smarter than a Drunk Driver?" will be from 10 a.m. to 2 p.m. in the Lowman Student Center Mall Area. The game-show activity will challenge student contestants to answer questions relating to alcohol and drug use, as well as alcohol-related traffic incidences for prizes. A tricycle race also will be set up for contestants to compete against each other while wearing beer goggles to show how drinking can impair one’s motor skills. For more information about the event, SWAAT or ADAI, contact Keathley at 936.294.1171 or hpe_rsk@shsu.edu. Career Services will provide students with many of the communications and networking skills they need during their Career Services Workshop Series seminar on Thursday (Oct. 7). The “Professional Communication Skills and Networking Workshop” will be from 1:30-2:30 p.m. in the Career Services Seminar Room. “In today’s competitive job market it is key that our students learn what top employers are looking for and how to gain that competitive edge,” said Cenaiyda Carranza, Career Services career counselor. “Effective communication ranks as one of the highest skills that employers are seeking in a potential candidate. Along with identifying key skills that employers are looking for, the workshop will cover the importance of networking and how to implement and practice effective networking strategies. All workshops are free for SHSU students and alumni. Career Services is located in Academic Building IV Room 210. For more information, contact Paige Loft, Career Services career fair and special events coordinator, at 936.294.1713.